Home / mobile / oppo / smartphone / tech / OPPO F11 will be available starting April 15 in the Philippines. OPPO F11 will be available starting April 15 in the Philippines. OPPO ended the first quarter of the year on a record high as it recently launched the much anticipated OPPO F11 Pro. Testament to this is the fact that it sold out units barely a week upon launch in stores! The OPPO F11 Pro has already exceeded all first-day sale records in the brand’s history. Furthermore, it surpassed 20% of the sales target making it the most successful launch of the brand to date. To further OPPO’s success, it is bringing the consumers the powerful features of the F11 Pro at a more competitive price with the new OPPO F11. 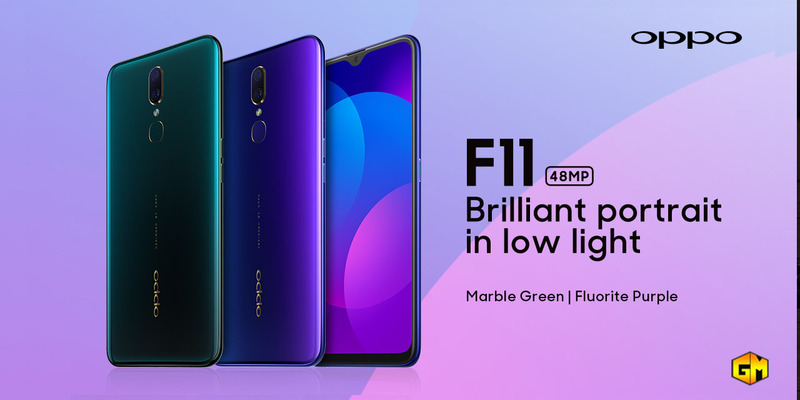 Much like its sister F11 Pro, F11 touts 48MP+5MP dual rear cameras with a 6P lens and an F/1.79 aperture for ultra-clear images with depth even in low-light conditions. The FHD+ resolution, and 90.9% screen-to-body ratio also promises an unrivalled viewing experience that’ll offer excellent entertainment for your eyes. The OPPO F11 combines the best of both technology and art with its sleek design and top notch smartphone technology. The OPPO F11 also will comes in two signature color gradients for a true-to-life color experience: Fluorite Purple and Marble Green. Starting April 15, OPPO F11 in Marble Green will officially be available in OPPO Stores nationwide, while OPPO F11 Fluorite Purple will be available in selected OPPO concept stores and authorized dealers. Customers can purchase this device at an irresistible price tag of P15,990, OPPO F11 users can enjoy almost same premium specs and features of the best-selling F11 Pro. You can also avail F11 through Home Credit at 0% interest, with 6 months and 9 months to pay.